*Gatefold sleeve reissue of this long out-of-print album, carefully remastered from the original master tapes* "Bassist / composer Charles Mingus is one of the most radical figures in American music. Throughout the ’50s, he worked as a sideman with legendary players Charlie Parker, Dizzy Gillespie and more. In the ’60s, he gained recognition as a bandleader, often followed by controversy for making strong-minded statements in the press about race, politics and stodgy music critics. While Mingus received many honors posthumously as well as during his career, perhaps his greatest achievement was transcending the restrictive label of jazz. 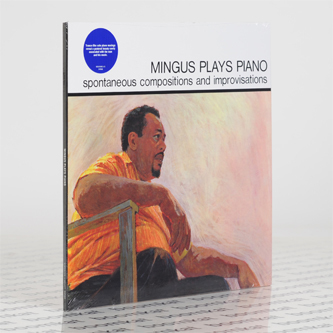 Mingus Plays Piano, released just a few months after his masterpiece The Black Saint and The Sinner Lady, is the only record to feature Mingus performing on his instrument of choice for composing. From the opening track, appropriately titled “Myself When I Am Real,” Mingus shrugs off any virtuosic pretensions of solo albums and stakes out more introspective territory. These trance-like, poetic musings reveal a tenderness rarely associated with Mingus, reminiscent of Erik Satie’s piano works and Art Tatum’s free rhythmic style."